In a control room, we should not see the raised floor as something purely technical, but as something that should add value to the environment and versatility to maintain installations. Both the surface finish, and the floor tile core should be designed for a long-life product, giving high guarantees from the first day in alignments, deformations or finish. RoomDimensions uses creative solutions and meets the needs of each environment that we develop, bearing in mind in all times the right percentage between quality and price. Technical ceilings allow a great variety of applications on a visual level (profiling, half hidden or concealed) and operational level (permissibility of agile redefinitions in modifications and speed of execution). RoomDimensions uses quality wall coatings, which can enhance the architectural design of the spaces and improve environmental conditions in control and meeting rooms, halls and data centers. 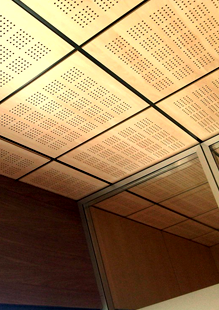 When it comes to a control room, it is important to think about the sound-absorbing properties of the materials in use to reduce sound reverberation and increase the degree of comfort of the control room operators. 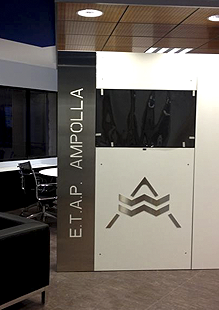 Among the materials we use, we include: compact phenolic resin panels, aluminum panels, stainless steel, glass, Alucobond/Alucore systems and Topakustic panels. The partitioning or separation of the different rooms that make up the space adjacent to the control room can be made by using different architectural resources, depending on the functionality of the resulting environment. RoomDimensions uses a self-supporting aluminum structure that allows the incorporation of panels of various sizes and materials, easily removable to facilitate the running of the cabling inside. The same kind of structure also allows the creation of glass screens for meeting rooms or the construction of wall cabinets for the location of documentation and of archives. RoomDimensions thinks it is necessary to incorporate graphical elements in order to improve the property's corporate values and enhance all technology stocks as an element of differentiation. These supplements are located to improve the final design of the environment, helping to enhance visual understanding and convert, in most of the cases, in elements of graphic communication. Enhancing the concept of overall project is one of our priorities. Thus, we put an emphasis on all areas of influence of the operating environment, which in many cases, form part of the same project. Establish design criteria, unify the overall image of the environmental settings, define the corporate image, enhance functionality, establish usability criteria, standardize technical furniture, etc. Corporate reception halls, waiting rooms, management offices, visitors halls, common and break rooms, crisis and meeting rooms, etc.